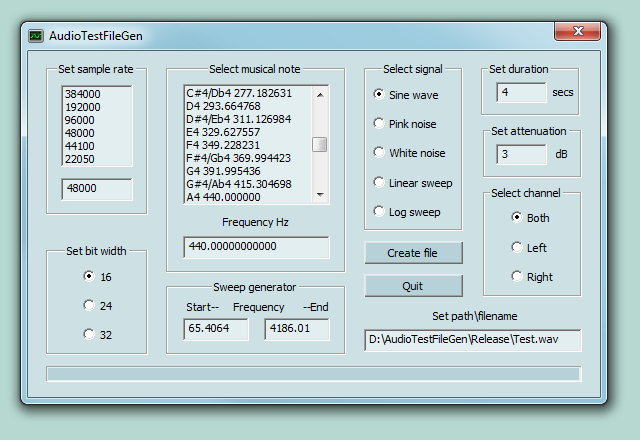 "The Audio Test File Generator"
Having received several requests for this, here I am making publicly available a recently developed variation on the ASIOTestSigGen. It generates Window's RIFF Wave Format audio files with mono or stereo signals of the highest precision, in the range of 10 Hz to the Nyquist limit, at sample rates to 384,000 sample per second. It includes pink and white gaussian noise and sweep generators. It allows you maximum freedom for all parameters: such as unlimited files lengths and non-standard sample rates. It will generate sample bit widths of 16, 24, and 32. The complete specifications are available here. The selectable musical notes are calculated to a precision rounded up to 11 decimal places, becoming a precise standard reference for the modern Even Tempered Scale to which you can calibrate your equipment and musical instruments. If you have any comments or problems with this please let me know.